Hi, I am interested in your 1972 Chevrolet Chevelle (stock #1273-NSH) listed on Autotrader for $33,995. I'd like to get more information about this vehicle and confirm its availability. 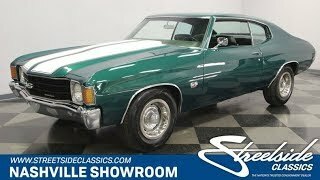 Pretty much everyone can agree that a Chevelle SS has been a desirable car from the day they were introduced in 1964, through various facelifts, and then through this model which is the last of the second gen cars. This car is largely original except for some quality work that involved dropping in a 454 along with adding some stripes and badging to create this SS tribute. Check it out. It is obvious that much care was taken to prep the surfaces and align the body panels before a drop of paint was laid on the car because the results look great. The light catches the graceful lines of the body and reflect off the muscular bulges of the front and rear fenders. Up front, a black grill flanked by single headlights on each side has an SS badge in the center. A sharp looking chrome bumper underlines the grill and white SS stripes run up the cowl induction hood. Chrome trims out the wheel wells and an SS 454 badge graces the front fenders. The SS stripes continue over the trunk lid and the back bumper has another SS in the center with round taillights to each side of it along with chrome exhaust tips peeking out from underneath. Open the door and you will find an original Dark Green interior that is in very good shape, but, being original is showing its wear in a few places. The split bench seat is in really nice shape as is the carpeting and headliner. A two-spoke steering wheel has an aftermarket wrap for both comfort and grip and the shifter for the automatic transmission is mounted on the column behind it. The upper dash pad is green with a black panel for the instruments and other controls. There is an FM/Cassette stereo for your listening pleasure and the ventilation controls include those for air conditioning to keep you cool on those hot summer days. A couple extra gauges have been added below the dash to help keep accurate track of the critical engine function of water temp and oil pressure. One of the advantages of a mid-sized muscle car is the nice sized back seat so your friends or family can join you on cruise nights too. Pop the hood and you will find a healthy 454 cubic inch powerhouse nestled down in a neat and clean engine bay. A chrome filter assembly feeds clean air to a 4-barrel carburetor and a Weiand aluminum intake manifold. Chrome valve covers add a splash of flash and the engine iron is painted Chevy Orange. Fresh belts and hoses keep things turning like they should and the engine running cool, and there is an updated A/C compressor to make sure things run cool inside the car too. A new master cylinder and brake booster put the squeeze on front disc brakes so you can haul this car back down from speed if you decide to let the horses run. Power flows back through a 3-speed automatic transmission to a solid rear axle with trailing arms and coil springs. Up front power steering works through a control arm suspension with coil springs along with a beefy sway bar to provide good handling. The rubber meets the road through 235/70R15 tires all around mounted on Rally wheels. This is the last of the really cool Chevelles and a nice SS tribute with a healthy 454 providing the go power. Come on down and check it out.